Quayside in Whitby is certainly famous for its delicious, award winning fish and chips, but it also has another, more historical, claim to fame. The building, which is situated on the pier, opposite the fish market, was once the town library and it’s here where it is said that Bram Stoker gathered his research for his famous novel, Dracula. Looking out of the large windows from the first floor, the views are panoramic over the harbour across to Tate Hill Beach below the East Cliff. This view has often been captured in paintings to accompany the gothic horror novel. The book was published in 1897 and it was here on Tate Hill Beach on the east side of town where the famous character of the vampire Count Dracula was born. The gothic history associated with Whitby has seen the emergence of two annual ‘Goth Weekends’ in the town and is also a cause for celebration of the ‘World Dracula Day’ which is on 26th May 2017. 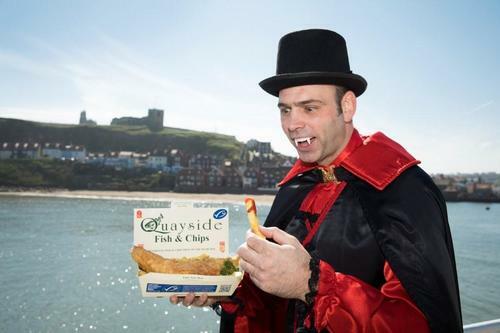 To celebrate World Dracula Day and the historical links to the Quayside building, Quayside are running a special ‘Dracula Deal’ for one day only which will be: A free glass of house wine with every Yorkshire Deal ordered on Friday 26th May 2017. (Don't forget the lashings of tomato ketchup to go with your fish and chips like Stuart)! Stuart Fusco, Head Chef at Quayside is pictured tucking into fish and chips in celebration of 'World Dracula Day' with the iconic Tate Hill Beach in the background where Dracula is said to have arrived in Whitby. This press release was distributed by ResponseSource Press Release Wire on behalf of Fusco in the following categories: Entertainment & Arts, Food & Drink, Travel, for more information visit https://pressreleasewire.responsesource.com/about.